A week of outdoor adventures in the Cuban countryside and coastline, and New Years celebration in colorful and vibrant Havana. To celebrate the start of 2019, Matt and I spent a week in colorful Cuba. We booked our tour through KB Tours, a Cuban organization that leads excursions based around a variety of outdoor activities. Over the course of seven days we’d be hiking, biking, horseback riding, snorkeling, and scuba diving. Our excitement only grew once we met our guide, a 25-year-old software engineering student named Gelín. He was warm and friendly, and very patient with us as we practiced conversing with him in Spanish. Matt and I were on our own that afternoon / evening, so we took off to explore Havana on foot. We got lost on the narrow streets of the old town, marveling at the bustle of daily life and the colorful (if decrepit) buildings. We meandered down the Prado, a wide avenue with a raised pedestrian walkway down the center of the two lanes. Eventually we ran into the sea, next to an ancient fortress protecting the entrance to the harbor. The 8km concrete seawall bordering the edge of Havana was a landmark we’d heard of: the malecón. This was the heartbeat of Havana, where fisherman worked early mornings, couples kissed while watching the sunset, and families gathered to dance and picnic. Our next stop was the Museo de la Revolución, which was situated in a grand old building that used to be the presidential palace. 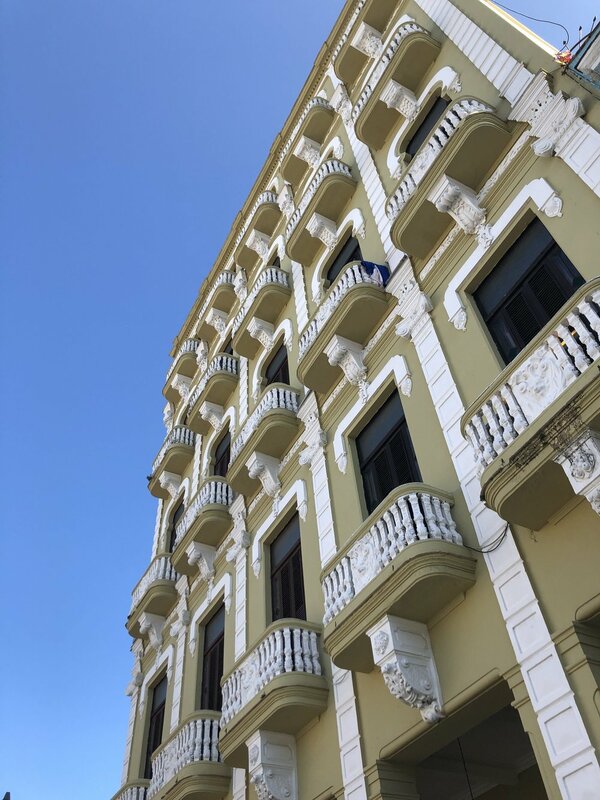 It was the site of Castro’s successful overthrow of Batista’s government, so it was transformed into a commemoration of the event with photos, relics, and detailed descriptions of the revolution. The lawn behind the palace building held larger attractions, such as tanks and planes as well as the boat that brought Castro’s band of revolutionaries to the island. Hours later we had wandered across the old town to the other side of Havana, where we discovered an enormous craft market filled with individual stalls selling paintings, instruments, and the wooden domino sets that were ubiquitous in Cuban homes. Next door we stumbled upon one of Cuba’s only craft breweries (what luck! ), and drank cervezas while we watched twilight hit the Havana waterfront. The next day began with a tourist must-do: a ride around the city in a classic convertible. Our driver, Alejandro, chatted to us in Spanish and played us his favorite songs about Cuba as we cruised the malecón. We hopped out at the Plaza de la Revolución, an enormous concrete open space big enough to fit two million people for important events. On adjacent government buildings were 100 foot tall sculptures of the faces of Castro’s two most valuable generals: Cienfuegos and Che Guevara. Next to the depictions of the generals were the phrases each was famous for: “Hasta la victoria siempre” for Che, and “Vas bien Fidel” for Cienfuegos. 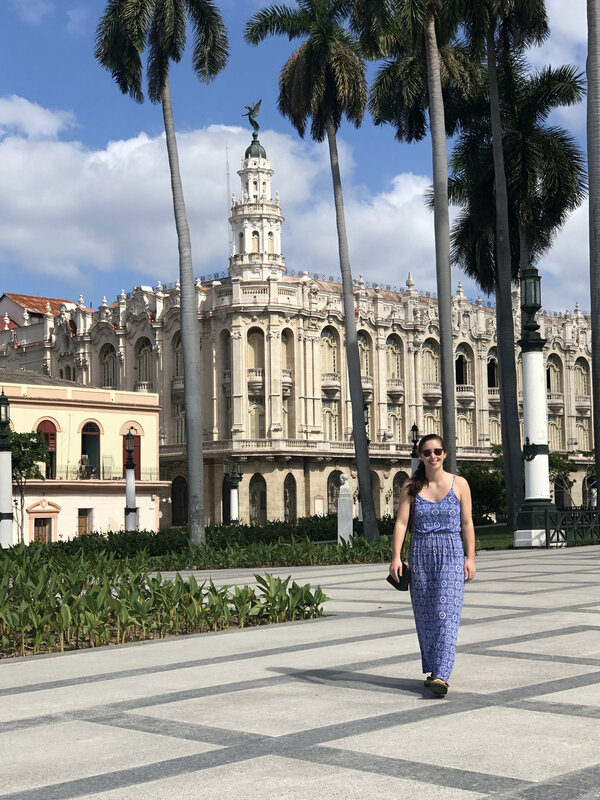 We finished the car ride on the far eastern side of the city center, and Gelín led us on a walking tour to the four most significant plazas in Old Havana: Plaza de Armas, Plaza de la Catedral, Plaza Vieja, and Parque Central. He gave us some historical background on the country (this was all review for us, since we had read a few Cuban travel books before flying in), and talked about the political climate of today’s Cuba. That afternoon we took a 3–hour biking tour around the Western side of the city. The first stop was the Cemetery of Cristóbal Colón (Christopher Columbus), an enormous town-sized cemetery with intricate sculptures. Next we stopped at John Lennon Park, home to a statue of the famous musician and, as our guide Baly described to us, a tribute to Western culture, which was formerly forbidden by the government. We pedaled north from there, through leafy quiet residential streets toward the ocean. When we reached the malecón we turned right and pulled over in front of the now empty U.S. embassy, where American diplomats were allegedly targeted with sonic soundwaves last year. Also along the malecón sits the iconic Hotel Nacional, perched on a bluff overlooking the sea. This grand hotel used to be the hangout for the infamous mafia members like Meyer Lansky. Our final stop was the Callejón de Hamel, an artist’s alley completely covered in colorful murals and poetry. There were painted bicycles hanging from trellises, colorful mosaics on every wall, and mournful verses scrawled on vintage bathtubs. The space was buzzing with creativity, music emanating from every doorway. As the sun began to set on New Years Eve, we broke off from the group and began to wander the streets of Old Havana, embarking on a six-hour long bar crawl leading up to midnight. Our only guiding beacon as we meandered around was the sound of live music. We’d stop at any bar where we saw a group playing instruments and singing Cuban songs, usually a small ‘paladar’ on the side of a plaza with chairs and tables extending into the street. 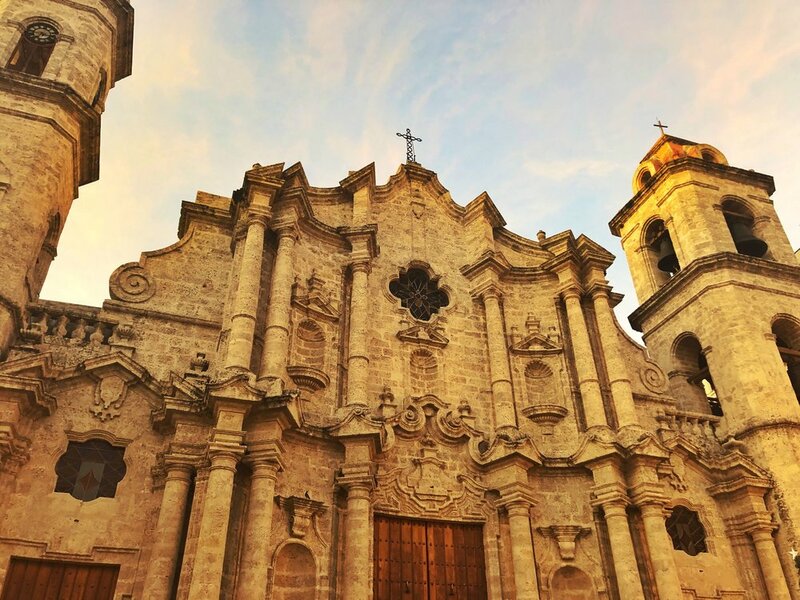 Between mojitos, Cristal cervezas, daquiris, and a multitude of small Cuban snacking plates, we made our way around the cobblestone streets of La Habana Vieja. The streets became more crowded as the night went on, entire families out to celebrate the last moments of 2018. As the clock ticked closer to midnight, we left the final restaurant and wandered back towards Parque Central. We perched on a monument in the center of the park, surrounded by stately hotels where partiers lined the rooftop decks. Along with the whole of Havana, we counted down til midnight and kissed to mark the first moments of 2019. The Bay of Pigs, site of the failed U.S. invasion from the ‘60s, happens to have a spectacular coral reef just offshore. We rented scuba gear (for me), and snorkel stuff (for Matt), and jumped in the warm turquoise water. The reef was vibrant and full of life, different kinds of fish swirling around the colorful coral structures. We swam out to a shipwreck offshore, where the reef had completely overtaken the former vessel, and counted snapper, lionfish, needlefish, and even a pufferfish. That night we stayed in Cienfuegos, a coastal town on the Southern coast. We arrived after dark, but we took advantage of the cooler evening breeze and went on an evening stroll down the main Prado street and along the town’s malecón. Gelín bought the whole group ice cream sundaes at Coppelia, a Cuban chain very popular with locals. The next day we embarked into the jungle. In the Escambray Mountains outside the town of Cienfuegos is a large nature preserve called El Nicho, which is famous for scenic hiking and numerous waterfalls. Our taxi van couldn’t handle the roads up into the mountains, so we climbed aboard a gigantic open-air rig that looked like it was set to drive right into Jurassic Park. We spent the day hiking the narrow trails through the park, stumbling upon waterfall after waterfall, each more stunning than the last. At the bottom of each cascade was a bright blue pool of clear water, and we couldn’t resist jumping in to cool off from the hike. It felt like we’d found our way into a fairy tale lagoon, and to be honest I found it really tough to leave. After our swim we hired a naturalist guide to take us into some of the off-limits terrain of the park. He told us about the different animals found in the jungles of Cuba (my favorite was the large Koala-like rodent called the hutía), and picked some fresh Cuban fruit from a tree to share with us. He guided us up into a large cave that he called Mammoth Cave, named for an elephant-shaped stalactite descending from the top of the rock wall. We returned along the winding 20km mountain road back into civilization, and started along the road to the next city on our itinerary: Trinidad. In Trinidad we all became Cuban cowboys. Our activity for the day was horseback riding, and Matt was a natural. We were each given a horse (mine was named Pony, Matt’s was Gabilán), and rode down a hot valley road into the wilderness. The first stop was at an old-fashioned sugar cane mill, where we learned how Cuban slaves used to extract the sweet syrup from the plant. The juice was mixed with lemon and we drank it in a refreshing lemonade-like cooler. After the sugar cane we rode further into the valley, Matt and Gabilán trotting off ahead of the rest of the group. My horse, Pony, clearly needed more motivation than the others, because from the back of the group our guide would click his tongue and call out “poooo-nyyyyyy,” which made him speed right up. The next stop was lunch, where we ate rice and black beans (as per usual) with fresh pork from a pig that was roasting on a spit over the fire beside our table. Yum! On we rode, bellies full of tasty pork and Cristal cerveza. Eventually we stopped at a semi-circle of benches arranged around an energetic man who began to maneuver a mortar and pestle in rhythmic tapping. Soon we could smell the roasted coffee beans, and he began to sing a Cuban folk song along with the metronome of his grinding. When he finished we all clapped, and he poured hot water over the grounds to fill tiny teacups of coffee for each of us. It was thick, aromatic, and very strong. After we finished our coffee, we each received the gift of a freshly rolled Cuban cigar to take with us. We got back onto our horses and trotted onward, starting to sweat in the strong late afternoon sun. It was the perfect time for our last stop of the day: a short hike to a pristine natural swimming hole. We swam under the shade of palm trees in water that was cool and lovely. At the far end of the small pool was a shallow rocky outcrop where dozens of travelers before us had stacked rocks into cairns to mark their presence. For the final time we mounted our horses and rode back towards Trinidad. Our guide led us up a steep slope to the summit of a small hill that overlooked the valley we’d spent all day riding through. We arrived just as the sun was sliding over the horizon, lighting the entire valley in a warm golden glow. After showering off the horse smell, we all met up for a final group dinner in the central area of Trinidad. Gelín knew a spot with a lovely open air rooftop, so covered in climbing plants and flowers that it felt like we were back in the jungle. To keep everyone awake as we waited for our meals to arrive, Gelín pulled out playing cards and we all participated in a giggly game of Old Maid. Matt ordered grilled shrimp (tasty) and I ordered my favorite Cuban dish, Ropa Vieja (even more tasty). Gelín led us on a short nighttime tour of the historic plaza of Trinidad, which became a UNESCO World Heritage site in 1988 due to its historic colonial homes. Gelín told us we needed to all try canchánchara, a version of moonshine that the local slaves used to make using white rum, lemon, and honey. The waiter brought over the liquor bottle, splashed the first few drops on the ground at our feed (apparently for good luck), then poured it into our outstretched clay cups from high above our heads. Surprisingly, I really enjoyed the canchánchara. Knowing I was interested in Santería, Gelín showed us a small temple dedicated to Yemaya, the goddess of the sea. Yemaya is seen as the mother of the earth, fierce and nurturing at the same time. There was a small altar in the garden behind the temple where worshipers places offerings in exchange for Yemaya’s intervention. When we returned to our casa for the night, Matt asked our host Narcisa if she wanted to play dominoes with us. She demurred, but told us that her grandson loved playing dominoes, so she went across the street to get him. Alejandro turned out to be a very friendly bartender in his mid-twenties who could whip our butts at dominoes. It was like he had a super power and knew exactly what pieces we had in our hands. Even with practice, I know we’ll never be as good as Alejandro. We had a few final stops before we began our long journey back to Havana. First we went to a picture perfect beach just south of Trinidad for some sun and sand. Next we arrived at a sparkling blue bay lined with palm trees and boarded a mid-sized boat that motored us out to a nearby cove. We all decided to snorkel this time, and clumsily jumped off the back platform with our flippers on. The fish here were equally colorful, but we had to practice caution in avoiding the thousands of tiny jellyfish floating near the surface. We all emerged with small red burns on our limbs from those sneaky little jellies. On our final night in Havana, Matt and I wandered the streets of the old town, stopping for beers and to listen to the ubiquitous live music. We found a tiny spot for dinner on a second floor balcony overlooking the Parque Central. We each ordered ropa vieja, our all-time favorite Cuban dish, to finish off our time in this beautiful country. We had about an hour the next morning before heading to the airport for our flight to Florida, so Gelín joined us on a final walk around the neighborhood. He showed us through Parque de la Fraternidad, a large green park next to the capitol that we’d somehow missed in our wanderings throughout the week. Each nation in the Americas donated a statue of an exemplary historical figure in the country’s history to represent the brotherhood of nations. As you walk the circular path through the park, you read plaques commemorating the great leaders and revolutionaries that fought for their countries. Once you reach the center, you stand beneath an enormous silk cotton tree planted in the soil of all 28 countries represented there. It was fitting to depart this beautiful place reminded of solidarity between nations, rather than animosity.